Week 6 of my US adventure! - Jamie McDonald: AdventureMan, Author, Speaker. Superhero Foundation. In week 6, I’ve crossed into California (! ), been absolutely terrified by a cougar and had a picture with Lois Lane… alright it was a road sign but it still counts, right? Running on in the afternoon, I tackled some big, long hills in my barefoot shoes and my calf muscles felt like they were on fire. I don’t have any flexibility at all in my calf muscles (or anywhere on my body in fact. I’m stiff as a board!). So going uphill in my barefoot shoes, I realised my heel hadn’t been touching the ground for a whole hour of running. In simple terms, imagine being on your tip toes for an hour! It burns… A lot! I changed to a supported shoe, so my heel was now taking the load. This meant my entire leg could take the load instead of just my calves, and they thanked me for it. This whole barefoot experience is just a steep learning experience in what I can and can’t do. By mile eight, I called my dad on Whats App while running. I hadn’t spoken to him for a few weeks. 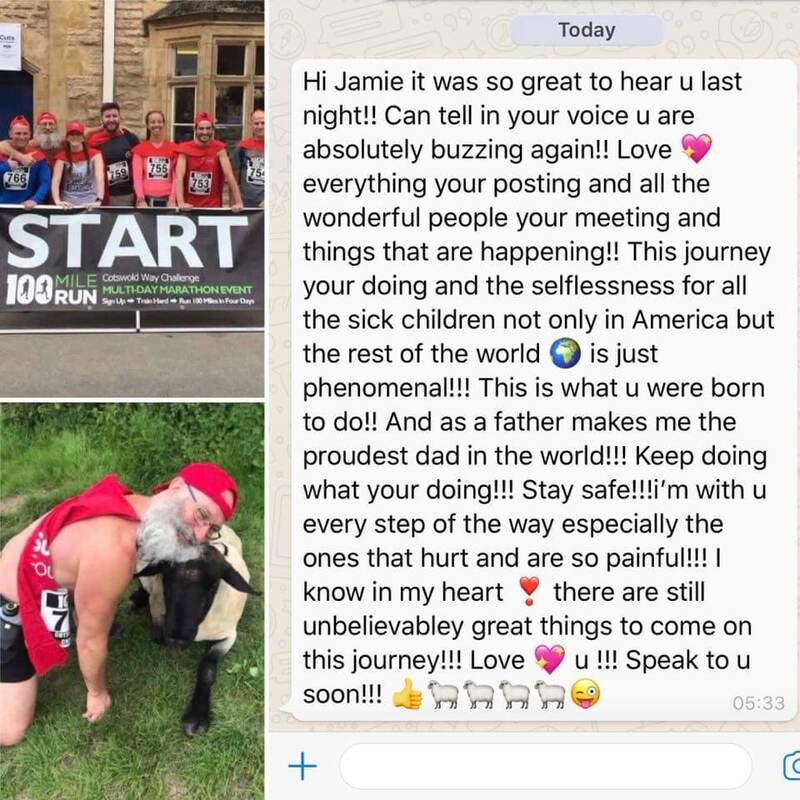 It turns out – and I really am losing it in terms of time and what else is happening out there in the world – he just finished running the 100 Mile Run in four days along the Cotswold Way, supporting seven superheroes who were all running and raising money for Superhero Foundation. All the superheroes did brilliantly and all raised thousands which is just AMAZING! “Hi Jamie, it was so great to hear you last night!! Can tell in your voice you are absolutely buzzing again!! Love everything you’re posting and all the wonderful people you’re meeting and things that are happening!! This journey you’re doing and the selflessness for all the sick children not only in America, but the rest of the world is just phenomenal!!! This is what you were born to do!! And as a father, it makes me the proudest dad in the world!!! Keep doing what you’re doing!!! Stay safe!!! I’m with you every step of the way especially the ones that hurt and are so painful!!! I know in my heart there are still unbelievably great things to come on this journey!!! Love you!!! Speak to you soon!!! It properly filled me up and made me laugh, especially seeing the sheep emojis at the end of the message! 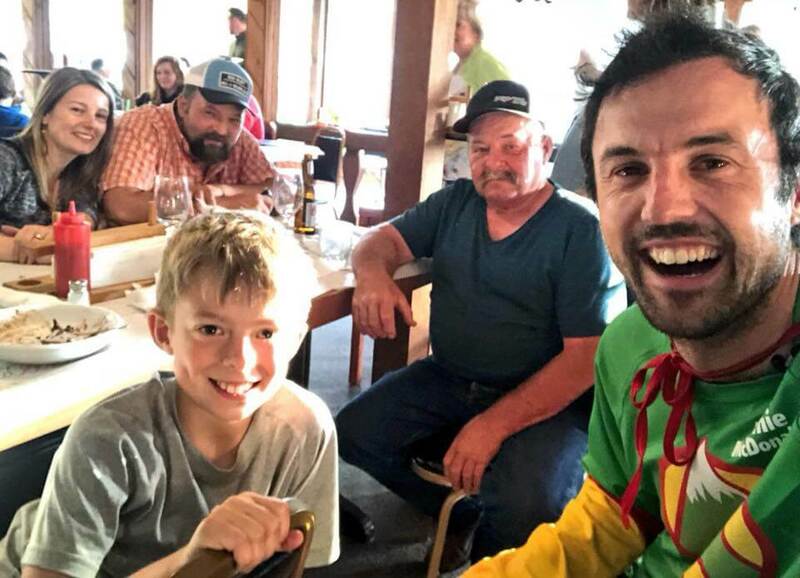 I was rocketing on the run, all the way to a quick pit stop at Tony’s Crab Shack. I scoffed some lovely fish tacos down my neck before running on. While in a bit of a meditation state, my brain jumped to a kid’s book. Don’t ask me how I got there, but I started to think about stories to share with kids; values on movement, purpose, giving back and killing a big arch enemy at the end of the story! Miles and miles later, I realised I’d been in another world, thinking HUGE! It was my dream place. Of course, putting dreams into action to make them happen are the hard part, but for now, I was loving my little dream world of having an Adventureman kids book series. I find movement does that, it makes you think big and believe in the bigness (if that’s not a word, it is now!) of it all. She squinted a bit at me, looked towards where I’d be camping, closed the door and that was the end of that conversation. Climbing into my tent, I spooned some canned tuna that was given to me by Jim, with a little bit of lovely butter. And an apple and honey for desert. I then drifted off to sleep, back into my dream world, full of BIGNESS. The next day, I saw a ‘Lois Lane’ road sign, I wasn’t sure if it was spelled right so I googled it. 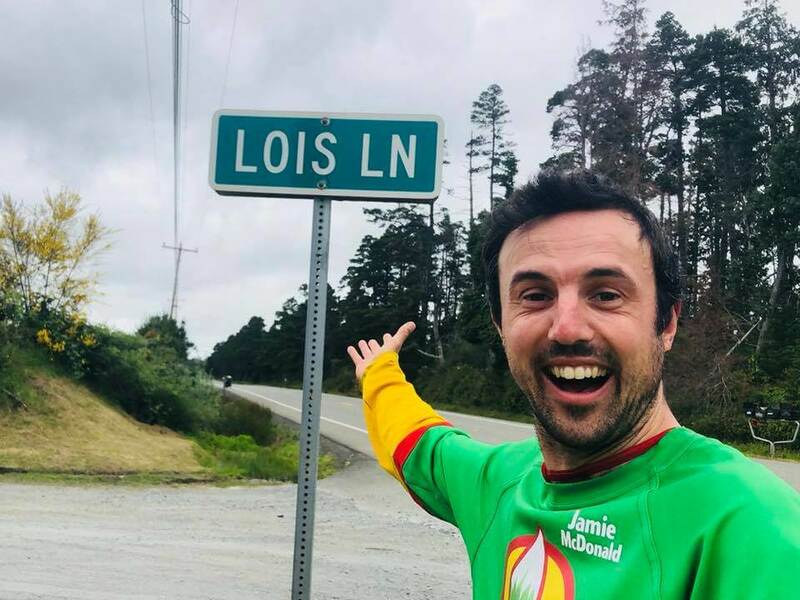 When I found that it was the right spelling of Lois – I realized I’d struck gold and cracked up laughing to myself. The Lois Lane sign was a distraction, on a day when my brain spent the day totally task oriented. I had deadlines going on in my brain; ‘I gotta write that blog, I gotta post about my book, watch the second YouTube video, share a news clip, I gotta tweak the fundraising page’. The to do list felt overwhelming. While I was having these thoughts and going through the list of things to do – my running pace got really fast. I felt like I was in this weird ‘hunting mode’ and if I didn’t make it to the destination quickly, I wouldn’t survive. 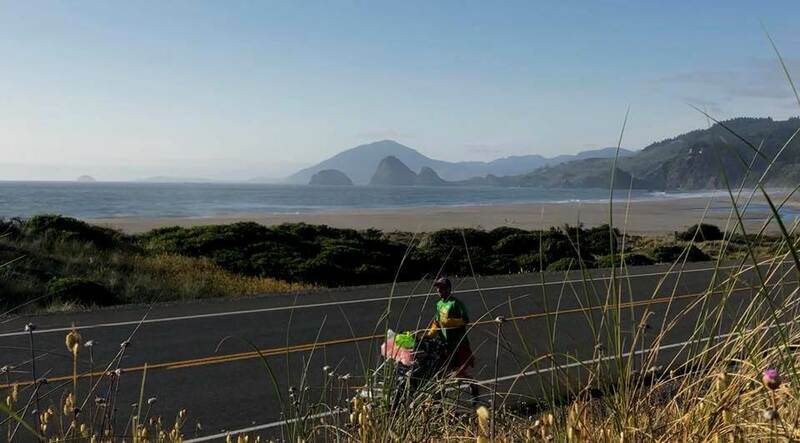 By the time I made the 20 miles into the town of Port Orford – my legs were knackered! I don’t really enjoy being so task oriented, as I feel much better when I can stay ‘in the moment’ on the run and enjoy things, but I did get the miles for the day done quickly. Later on in the evening, I began working my way through the to do list to help with fundraising, but it still wasn’t enough. After five hours of sleep, I woke up at 6am and continued on working until 9am. Sometimes the running is only half of the difficulty in this challenge, but I’m not complaining, fundraising is what it’s all about, so its hours well spent! To treat myself after all the work, I went to Tj’s Cafe for breakfast and ate two pancake meals. Who knew that syrup poured over eggs and sausages worked so well as a combo?! If you did that in the U.K, putting sweet and savoury together it would be considered a crime! During the run that morning, my calf muscles began to feel on fire again. They seem to be getting worse day by day at the moment. The pain was so bad one point, that I had to run really, really slowly – at a snail’s pace. I came across an amazing ocean view, but my brain annoyingly would stop thinking about my pathetic calf’s long enough to enjoy what I was seeing. I knew these were irrational thoughts, so for the first time on this trip, I put my headphones into my ears from my iPhone, signed into Spotify, and clicked on Robbie Williams’ greatest hits. The first song that came on was, ‘Rock DJ’. Oh yeeeeah! And please don’t hold it against me for being a Robbie fan will ya? Within a few minutes, the music and Robbie changed my world, I was now looking at the stunning ocean view, signing my heart out (luckily no one could hear my singing!). How have I not listened to music for over a month? It was a reminder that it’s something I need and love. I plodded along slowly until reaching nine miles. For my middle of the day break, I rolled my mat out on a piece of grass and put my head under Caesar so it was out of the sun. I then put Robbie on loud speaker. Running on, still very slowly, I was readying myself to camp in the bush, to camp anywhere really. But just then I saw a sign that read, ‘Honey Bear Campground up ahead’. Any sign with the word ‘honey’ in it would win me over. 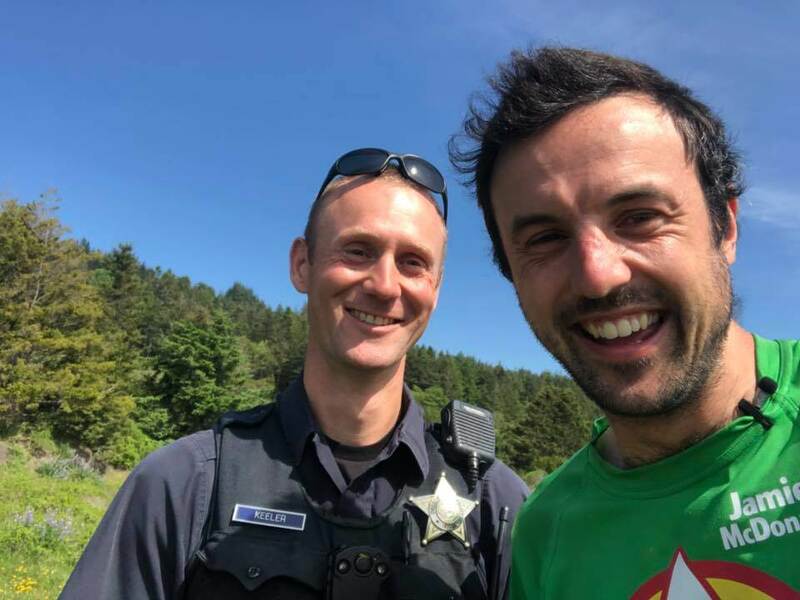 After a one-minute meltdown, I checked on Google maps and it turned out that the campground was only just off the highway and wouldn’t actually add any mileage to my run. Boooooom! Honey Bear here we come! As I arrived, things got even better. The next sign I read in the campground said, ‘Bar & Grill’. As I set up my tent. I could hear music playing in the distance. Once the tent was up, I headed to the bar. I got myself a pint of dark stout beer, half a chicken and sat and listened to live music! I’d struck gold. The first song came on and it was ‘homeward bound’. Though a little too soon for the words to be meaningful in my journey – I just loved every single word of it. I would have kissed the man signing if he’d let me. While I was enjoying the music, a kid came over holding a $20 bill and said, “this is a donation”. He said he was here with his family, so I walked over to meet the Kudlac family. As it turns out the Mum had seen something about me on Facebook the other week and wanted to donate. Our Facebook energy is working (so thank you!). Walking back to my tent, I thought, ‘I love how unplanned and bonkers this day had been!’ One minute I was planning on sleeping in the bush, and the next minute I’m drinking beer, eating a warm chicken, listening to live music and seeing yet more incredible kindness in the local American people. I drifted off to sleep in on a state of peace and harmony. In the morning, as usual, my calves & Achilles tendons felt like they’d been beaten with a baseball bat as I slept. I stretched them off as soon as I could but couldn’t help but feel very gloomy about the start of the day. As I got running, I called my trusted friend, Ed Archer, who knows everything there is to know about a moving body and knows my body well. “Ed, what do I need to do to sort my calves out?” I said. Ed logically replied (it’s always logical), “I’d suggest every night putting your heels over a step, or a tree log and put all your weight down on it for three minutes on each leg to stretch out your calves. And do you have a rolling stick you could massage yourself with? Unless you can get a massage?” He laughed at the massage bit, knowing it’s pretty darn difficult to sort that out here. It turns out, I do have a rolling stick, and I haven’t been using it. I think I convinced myself that my legs were injured rather than super-tight. So I’m going to try and use this to heal the issue. Sometimes you can get so stuck in a thought process that all you need is to hear the obvious. We’re going to keep up with this strategy for three days and then reassess. My favourite part in this message is the word ‘innovator’. As I’m spending so much time worrying about being injured (when the reality is 6,000 miles is of course going to result in injuries!) but the word ‘innovator’ has given me hope – as it’s a great reminder that there’s always a way to heal and keep running. With hope, I managed to clock up a 20-mile run that day. Pretty exhausted, I knocked on a random door to ask for a camping spot in their front garden – which actually scored me a double mattress in their guest room. Boom! 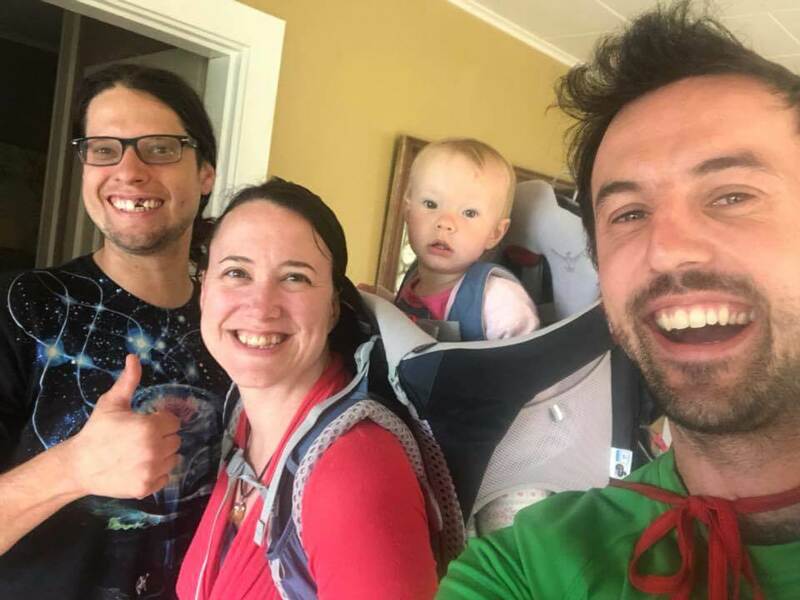 During breakfast with Jarek and Angie who let me stay for the night, I learned that they used to own their own cannabis field to help people for medical purposes and eventually sold up to live here in Pistol River. They even had 15 employees for all the growing! It blew my mind – the whole cannabis thing being legal in Oregon. As we were chatting I wanted to quieten my voice like we were doing something wrong by talking about it. I filmed them both chatting about it, you just never know who you’re going to meet on an adventure like this! That’s the beauty of it – it’s not for me, but everybody is different and all I like to do is accept people for who they are and try not to judge when I come across something that’s different to what I know. I did think about not adding the cannabis farm bit in my blog, as I know kids sometimes read them, but hopefully it’s okay and just something that’s happening in the world, and it is what it is. As I’m nearing the border to California, I’m getting really, really excited about what’s to come. Looking back, one of my highlights was an interview I did with KATU News, hanging out at OHSU Doernbecher Children’s Hospital doing some colouring in with some kids – which was just amazing. Crossing the border into California, I’m not feeling ultra-confident with my Achilles heel pain, but who cares? I’m super excited to hit California, I’ve dreamt about being in this part of the world many times, and I’m finally here! With some calculations, I think it’s 600 miles down, 5,400 to run across the U.S. The night after, I found a gem of a spot, right in a tree as there was a gap in the trunk. I lit a fire to make it cosy and went to grab my food bag and that’s when I heard a ‘CRACK’. The crack was about 20-30 metres away through the thick, foggy forest. I looked to see what it was, the entire thing felt like something out of a horror movie. I grabbed the camera, there as there was a tiny bit of logic still working in my brain at this stage. That’s when I went into sheer fight and flight mode. I couldn’t tell you which mode I was in though. First, I screamed, ‘COME ON THEN – I’LL AV YA!’. The next minute, I went into sheer, ‘I NEED TO RUN AND GET THE HELL OUT OF HERE!’ I was caught in-between the two modes. I took a deep breath and my hands began to tremble. I had no phone signal. Nothing. So I went and grabbed my knife. My brain wanted to explode with fear. I tried to rationalise my thoughts by saying it was an elk but I just couldn’t stop thinking it was a cougar. More cracks came, and it seemed to circle me, as if a cat would circle their pray which didn’t help. After the cracks had stopped making noise, it still didn’t stop me from being starving hungry. Though, I didn’t want to crack open Jim’s homemade canned tuna because I thought cougars would love that. Along with a bit of British meat. Then I thought I’d crawl into my tent, but I knew that wasn’t going to save me either. So, I popped open the can and threw the tuna down my neck, I didn’t even spend time chewing it, I just swallowed it. After a few more minutes, listening to the sound of the forest and with it getting darker and darker by the minute, I climbed into my tent. Still in sheer terror, I grabbed my food bag and grabbed two packets of biscuits and sugar binged like I’ve never done before. The biscuits still weren’t enough sugar, so I grabbed a cliff bar too and my honey jar and scoffed that as well. I did surprisingly feel a little bit better afterwards. With a full belly, I started to think about sleep and then I realised I left my sleeping bag in Caesar, which was now 40 metres away. Which meant, I’d have to walk in the pitch black to get it. I knew I wouldn’t sleep without it, so I had no choice. I grabbed my head torch and walked the trail listening to every inch of the forest around me and quite literally nearly pooed my pants the entire time. I kept telling myself, “you’re going to be okay, this is all in your head’ but it didn’t help. I was waiting to be pounced on by a cat any second. Making it back into the tent was an achievement. Trying to sleep, I led on my back with my knife next to me and just tried to relax. I know – relax?! Right?! I didn’t sleep a wink that night. Come the morning, the Redwood misty forest was still as scary as the night before, so I packed up as quickly as I could and ran the hell out of there! I’m alive, and I didn’t get mauled by a cougar – though I do feel like I slept with one. What led me to this traumatic ordeal? After the crossing, I brought up Google maps and zoomed out to look at the entire size of California and I had a slight anxiety attack. It’s enormous. Like, nearly twice the size of England. After the shock, I continued on the running, the sun was shining and within a few miles I started to relax and enjoy the fact that I was now running in CALIFORNIA! At the end of the run looking for a camping spot, I knocked on a door in the countryside once I’d seen some lovely lush grass. After a little chat with Barbara and Neil, I was inside their house, eating venison spag bol and sleeping on their couch. Just lovely. That night led in bed, someone sent me a BBC News link to a Cougar attack. The headline reads ‘Cougar shot dead after killing US cyclist and mauling another’. Just to make it a little more scarier, it was actually somewhere near where I was running a month ago up North. If I’m being honest, over the past 40 days of running, I’ve been told over 100 times on this journey, ‘watch out for the cougars’ and I’d always think, cockily, ‘yeah yeah – they don’t really exist, it’s myth.’ Which, in a way this naivety helps me when I’m camping out in the wilderness on my own to not get scared. But, reading this story, it really hit home that they really do exist. 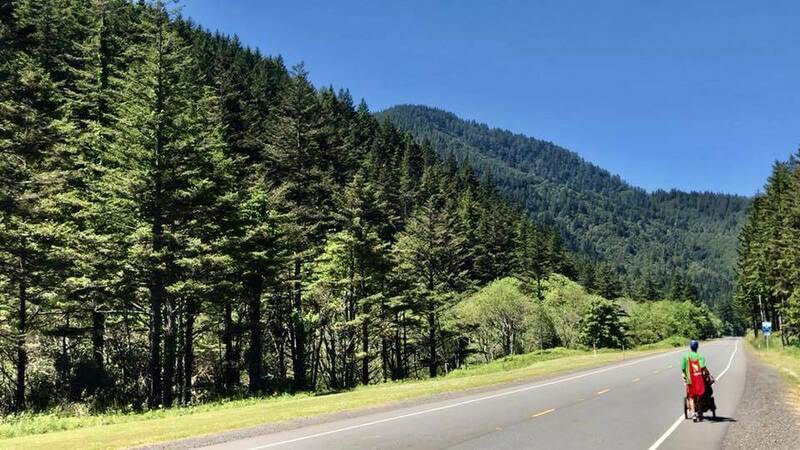 The next day, my Achilles heel pain I’d been feeling over the last 10 days had gone – and I loved every mile and didn’t think of the cougar story once. Maria started with a drink and brought me a horchata which was like a thin version of milk with a hint of flavoured coconut. Then for food, she brought out a spicy arroz con pollo – which was rice, chicken and cheese all in wraps. It was amazing and when it came to the bill, Maria said, “it’s on the house!” She was the sweetest Mexican person you’d ever want to meet. Running on, I made it to the Redwood Hills for a huge mountain climb. On my way up, I was panting like an exhausted dog and about 15 miles in, a lady called Liz turned up to run with me. She was friends with Neil and Barbra and wanted to come and support. Her timing was perfect. We took it in turns on pushing Caesar up hill and chatted the best we could through gasping for oxygen. Eventually, we made it to the top of the mountain proud of ourselves and Liz turned around to run back to her car to leave me for the night with my camping spot. I’ve also uploaded my first video diary on YouTube this week!